With 2 photos and an interesting link. I want to tell you how he died, and the extraordinary thing that happened next and how he had arranged that. But I want to protect his privacy and his family’s. So I will call him Harry. Please do not assume anything about where he lived or how I knew him. All you need know is that he was a retired businessman, quite successful, a civic leader, and a convinced Christian. He talked to me more than once about dying, and always as being natural and not to be feared because he’d be in Heaven. One more thing. He was happily married for more than 40 years, with a fine family. They were comfortably off. No mortgage. Never behind in his routine monthly payments. He was in good health, or thought he was. He and his wife lived alone now – I will call her Harriet – with their children and their families widely dispersed. One day after their late evening meal, he got up with his wine glass to put it in the sink—just one glass with dinner every night, and always red. And fell to the floor. Harriet was shocked. Dropped to her knees to help him. He seemed dead. Yes, dead. Just like that! What to do? She was shaking but in control. She rushed and dialed 911. In less than 15 minutes an ambulance pulled up and the crew of two rushed in. They tried to revive Harry. It didn’t look good. They strapped him into a litter and speeded toward the hospital. Harriet got into their car and kept up right behind. Harry was wheeled in. She followed but was not allowed beyond a certain point. She was told to take a seat.. In 15 minutes a doctor in whites approached. “I’m very sorry, Ma’m. We tried and tried to revive your husband. There here was nothing we could do. So sad! Would you like to see him?” She said yes. He took her by the arm and led her to a patient room. Harry was on the bed, a sheet pulled up high. His hands were crossed on top of the sheet. His eyes were closed. No sign of pain. Looked normal. Seemed at peace. He said a few nice words, gave her a few instructions, walked her out, wished her well. And she drove home. She was tempted to call her children, but decided to wait. She found Harry’s wallet and pulled out a card she knew was there. Had been there for more than five years. The printed name on it was Anatomy Gifts Registry. She dialed its toll-free number. As late as it was, a woman picked up. Harriet told her Harry had just died. The woman was sympathetic and gentle. Harriet answered her questions. The woman told her what would happen next. There was no surprise. Harriet was familiar. She and Harry had thoroughly discussed the pros and cons of his becoming a member of the Registry. Now she called her sons and got them. They were in shock, of course. It was staggering news. So sudden. So unanticipated. She told them everything, calmly, still in control, and answered their questions. They knew all about the Registry. Now she went to bed. Could not sleep. Reality had set in. She spent a bad night. In the morning she went about her day as well as she could. She had nothing special to do. There would be no funeral. No religious service. No obituary. No cemetery. In due time the family—all lived far away–would gather for. She was following through. I happened to call just two days after he died. We were close and I kept in touch. “Harry has died,” she told me flatly. I couldn’t believe it. I asked if I could stop by and she said yes. I canceled my appointments. Finally I got there. She told me the shocking story. Unbelievable. About the decisions she had made.Then a bit about the Anatomy Gifts Registry. I knew nothing about it. I had never heard of a situation like this. I did not approve but I kept mum. It all seemed so strange. I asked questions, as gently as I could. And she answered them. As I said, I was a good friend of theirs. I mentioned that some kind of ceremony should be held. Said it was important. Essential. For their friends. For the community. Harry was well known. Most importantly for psychological “closure” for herself and her family. This is what everybody does. What the whole world does. “Please tell me more about the Registry.” She did. Explained it was arranging to have Harry’s body picked up at the hospital. Probably had already done so. It would be used for medical and scientific purposes. The Registry’s services were free. She had no specifics but had complete faith in the organization. In time Harry’s cremains would be sent to her. She and the family would wait for that and then hold a private celebration of his life. Later I went online and looked up the Anatomy Gifts Registry and got more detail. I was impressed. At another visit with Harriet, she told me she had checked the price of a funeral and found the simplest one would be a thousand dollars. So she had written out two checks, each for $500. One as a gift to the ambulance service and the other to a community organization that both of them thought highly of. I keep in touch. Harriet is busy in all her usual ways. She got through Christmas and New Year’s and is enjoying life. In fact, insists she is, and I believe her. Certainly word is getting out that Harry died. They were active in the community. When she meets someone and they ask, she tells them the story in a simple and open way. Everybody is shocked. They’re free to think whatever they like. No problem. Maybe in time some will understand. Even approve. I spoke to her a few days ago. From California, where I’m living now. Friends back there always ask me about the weather and I tell them mild, no snow or ice ever. Always tell me how fortunate I am. She asked me about it and was happy for me. Happily told me about a gentle cover of snow that had fallen and how beautiful everything was. She said that Harry and she had developed these ideas over the years. Were in agreement. They felt the less fuss, the better. Cemeteries are wasted land. Monuments unnecessary. You have a monument to the person in your own heart if the person means something to you. I was curious how many “gifts” the Anatomy Gifts Registry receives every year. I was also curious about other things. I went to its website and read everything there. Saw photos of its facility in Hanover, Maryland. I was impressed, I put in a call and had the good fortune to speak to Kana Neibert, assistant director for Compliance and Operational Oversight. She was pleased to explain. The Anatomy Gifts Registry is a program of Anatomic Gift Foundation, Inc. It is a non-profit, the only non-profit in the country. Founded in 1994. It received 151 donors in January and a total of 1,298 in 2016. It has 19,000 signed up in its registry. She told me, “We accept donors who sign up in advance and donors whose loved ones decide to donate after passing has occurred. We accept donors from most states and use funeral homes and transporters to help ensure the safe sheltering and transport of donors to our facility in Hanover. We accept donors who have also donated or want to donate for life-saving organ and tissue transplant. “The only financial costs related to donation for surviving family members are for a certified death certificate–its cost varies in state. And if they want their loved one’s ashes returned to them by mail, currently we charge $35 for the materials and postal shipping cost. Families can opt to come here to pick up ashes. 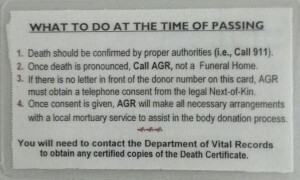 “Once we receive the signed authorization forms, the ashes are usually mailed out within 4-6 weeks of the donation. I asked how the donors are used. She answered in detail. Maybe more than interests you. Anyway, here’s her answer. “We host a variety of lab events on site. The majority are paramedic airway training labs where attendees are practicing airway intubations and other critical, life-saving first responder techniques. We annually host a local flight paramedic group as well who are responsible for search and rescue operations. “Additionally, we also host multiple training labs where surgeons are testing devices that are under development. These labs are typically for joint replacements/revisions or new minimally invasive surgical instruments. “Twice a year we provide four days of student anatomy labs where we invite the local universities and colleges to send students and faculty to AGR to learn about anatomy with a hands-on teaching course. Students receive a certificate of participation and many of the faculty have included our lab as part of their curriculum. “The demand for anatomy labs is also high for high school students enrolled in college-level or honors coursework. We generally have 10-12 high school labs per year. “Most of our clients work at teaching hospitals and are involved with either research (Alzheimer’s, diabetes, Parkinson’s, multiple sclerosis, Hereditary Hemorrhagic Telangiectasia, etc.) or surgical training (trauma reconstructive surgery for the head and face, food/ankle repair, carpal tunnel release, spinal fusions, hearing and development, etc.). “We have a large variety of researchers and educators that receive specimens. Since we are non-transplant, we do not send organs out for implantation into living humans. We do, however, support the work of transplant organizations and work with them regularly for shared donor cases. “For anatomical gifts that are shipped offsite, the AGR Officers heavily review all tissue recipient applications. The reviewer must indicate specifically what the scope of their work is, the intended use, length of time they will have the specimen, and how they will properly dispose of the tissue afterward. “For anatomical gifts that are shipped offsite, the AGR Officers heavily review all tissue recipient applications. The researcher must indicate specifically what the scope of their work is, the intended use, length of time they will have the specimen, and how they will properly dispose of the tissue afterward. She also sent me photos. Worth seeing. Unfortunately not in a format I can download. 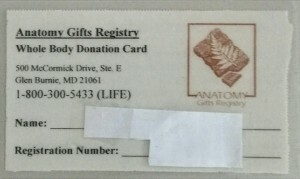 Here is the Registry’s Link: http://www.anatomygifts.org/home.html. I think you will find the photos and the info about the Registry interesting. So, as you see, in dying, Harry made sure that his body would not just rot in a grave. It would be put to the service of others. Harriet made no further mention that she was planning to do the same thing. She knew I knew that. The plan that Harry set for himself, and Harriet now, set for themselves is worth thinking about. Sure, it raises eyebrows. Many new ideas do. It’s a good plan. In fact, noble. Truly noble. It helps countless living people. Maybe me someday, maybe you when we find ourselves facing a sensational new operation or medical procedure. What Harry decided, and Harriet is also inspired to do, is simple. It eliminates many problems and decisions. I didn’t know zilch about all this till it happened. But one thing is for sure. I’d insist on a memorial service at the minimum. But how about you. What do you think?